Whether you've heard of innovative Bissell vacuum cleaners or their powerful steam machines, the long-lasting Bissell company is quite popular in the world of household cleaning. The next time you are interested in purchasing a new vacuum to accomplish the various levels of cleaning associated with carpets and floors, Bissell offers an extensive line of products that includes deep cleaners, hard floor products, cleaning formulas, and carpet sweepers. Read consumer reviews written by other visitors to this site, or submit your own. When it comes to Bissell vacuum cleaners, their uprights, stic vacs, and canisters are well liked in all corners of the world. Since 1876, Bissell has excelled in creating cleaning tools and machines that elevate the comfort and cleanliness of a household. In the mid-1800s, the start of the company actually began with a small crockery shop situated in Grand Rapids, Michigan that was owned by Anna and Melville Bissell. With piles of sawdust covering the shop and attacking the carpet, sweeping the tiny particles was near impossible. Anna voiced her opinion to Melville, who was quite handy and decided to design a carpet-sweeping machine that would make things much easier to manage in the shop. Over the years, the Bissell name would evolve to include a range of other products. Throughout the 1950s, the Bissell multi-purpose formula and shampooer cut down on the time required for carpet cleaning. The company also concentrated on providing the public with practical, lightweight products that could accommodate small living spaces. The Bissell vacuum cleaners have also gained quite a following. Popular selections include the Bissell 7920 Upright, which possesses an on-board heater for tap water that other models do not furnish. With the Bissell 1950-G Deep, the reliable cross-action brush makes dirt removal much easier, as it works just as well as a full-size upright deep cleaner. Those considering a Bissell BS5200F Flip-It has the convenience of wet or dry cleaning that safely deals with all sealed hard surfaces. The easy use and compact size of this model is also heightened by the ergonomic design. When browsing the impressive line of Bissell vacuum cleaners, you will find numerous selections that will keep your home tidy and fresh. Below are a couple of Bissell cleaners that are quite popular with the public. With the Bissell 3990 upright vacuum (priced between $140 and $180), consumers are often interested in testing out the scented results that come with this model. The 12-amp, multi-surface upright vacuum cleaner utilizes its cyclone technology to create enhanced suction. The cleaning-rotating brush action supplies attention to the complete floor and deep cleaning tasks. With this multiple stage filtration, the filters stay clean for a longer time due to unrelenting suction power. Health conscious consumers are often pleased with the results, as dustballs, hair, and small pieces of junk literally disappear. The praise is never-ending for the Bissell 3990 because it produces less noise than other models and doesn’t take much to handle (due to size). Additional features that have attracted customers include the foot-activated brush off pedal, easy height adjustment, washable pre-engine filter, lengthy cord, and sturdy build. When it comes to the disadvantages with this Bissell vacuum cleaner, some consumers have complained about the length of time it took to read the instructions and assemble the product. The post-engine HEPA filter that requires the occasional replacement was a hassle to some. Although the cord was long enough, the time it took to wind-up became an irritation for some, while other buyers wished they had a longer hose instead. The Bissell 20Q9 CleanView bagless vacuum carries a price tag of between $75 and $100 that is backed by a 1-year warranty. The bagless technology that increases the power of suction to allow a more advanced cleaning experience has attracted a large following. Allergy sufferers particularly enjoy the HEPA media filter responsible for trapping 99.9% of dust mites, pollens, and ragweed found in the home. On-board tools, such as the TurboBrush for pet hair become genuine lifesavers. This Bissell vacuum cleaner also comes with seven height adjustments and a 27-foot power cord. 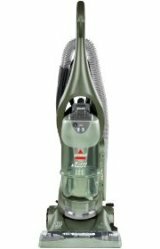 Consumers who have purchased the Bissell 20Q9 CleanView vacuum have noted it is amazing at picking up everything with the help of the long hose attachment and convenient tools. Assembling the vacuum wasn’t too complicated as well, nor was emptying the dirt cup. While the filters require replacement, the HEPA media filter runs less than $10. Additional features include soft bumper sides, easy carrying handle, and helpful headlight. While the pros of this line of Bissell vacuum cleaners are quite apparent, the machine is sometimes characterized as large and heavy to some. Like the other Bissell vacuum cleaners, the Bissell 3910 vacuum costs between $100 and $120 with a host of features that has produced many satisfied customers. The “cyclone” technology has boosted the efficiency of the filters, which accommodates the 12-amp, upright vacuum cleaner. Large debris is no match for the filters as the suction of the vacuum cleaner continues to deliver with persistence and power. When trying to reach tight spaces, the ergonomic design offers enhanced maneuverability. The HEPA filtration promotes better air quality that is monitored by an airflow indicator when the filter requires cleaning. Additional considerations include a crevice tool, curved extension wand, and a brush for upholstery and dusting.